You don’t need to be rich to rent your own swimming pool cabin. Many people look for something different to do for their wedding or event, why not incorporate a beautiful indoor swimming pool cabin? We have had many people utilize the indoor pool area as well as the outdoor area into a beautiful oasis. We leave it up to your imagination as to how to decorate the area but all through the website there are pictures and ideas of what prior guests have done. If you would like to find out more about our cabin with an indoor just click here. 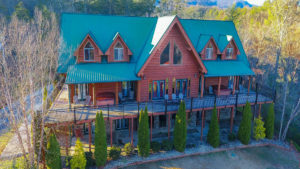 Pigeon Forge – Private Heated Indoor Swimming Pool Cabin! STOP! You have to read this!! Don’t schedule any family reunion without an Indoor Swimming Pool Cabin. 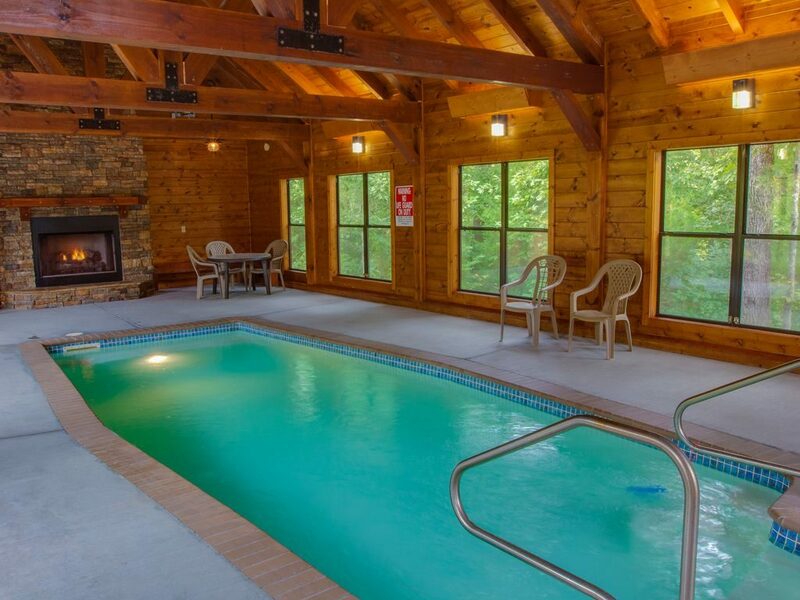 Did you know you could save hundreds, if not thousands of dollars by renting a cabin with an indoor swimming pool? The amount of time and enjoyment you get out of it will surely be worth the investment. A lot of lodges only offer a place to sleep and very few amenities. At Moose Hollow Lodge we have thought of everything. We not only give you luxury accommodations, we also provide this wonderful heated private indoor swimming pool cabin, chapel conference center, arcade, theater and more. Most of our guests find that we offer so many amenities that they end up saving a lot of money by not having to go in to town. That’s right, going in to town and having to entertain your group at theme parks and dinner shows is great but can get very expensive. Reserve now and take advantage of all we offer at Moose Hollow Lodge. Cool off from the summer heat and protect yourself from the summer rays. Take a dip in our private indoor swimming pool cabin. That’s right, this swimming pool cabin is fully enclosed and air conditioned. When other people are sweating from the summer heat you will be lounging around in the swimming pool cabin or next to it watching your loved ones swim. How about a night time swim? Well this well lit area allows you to enjoy the swimming pool cabin without having to worry about mosquito or bugs of any kind. Reserve now and make this happen. You will love what we have put together for your enjoyment at Moose Hollow Lodge. We not only offer an indoor swimming pool cabin as extra amenities. Jump out of the swimming pool and in to one of two hot tubs! 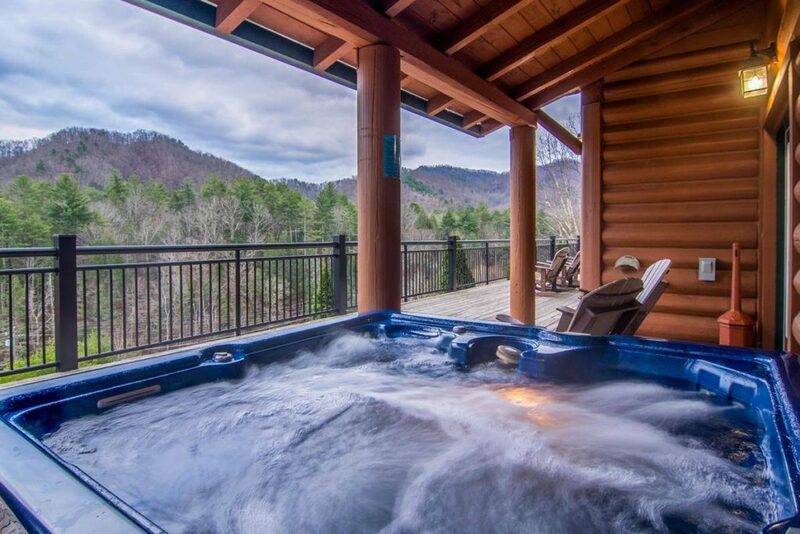 That’s right, there are two hot tubs, both located on the main deck between bedrooms. Just image, it’s a bone chilling night and you come right out of your room and get in this steamy hot tub with your favorite drink and friends. Enjoy the mountain night air and taking in the wonderful views during the day. Total relaxation awaits as bubbles message your stiff back. Don’t wait any longer, book now!